I'm still kinda in shock. [SIF]NZ_Flying_Shark, if you are reading this : I am so, so sorry Dude. In the early stages of the game I had approached the cap and was parked behind an island trading fire with a Neptune and a couple of other enemy ships. The Missouri came up from behind me and passed in front towards the gap I was firing into. I knew he was there but figured he was far enough in front and to one side, and I really wanted to score some hits on the cruiser heading into cover. 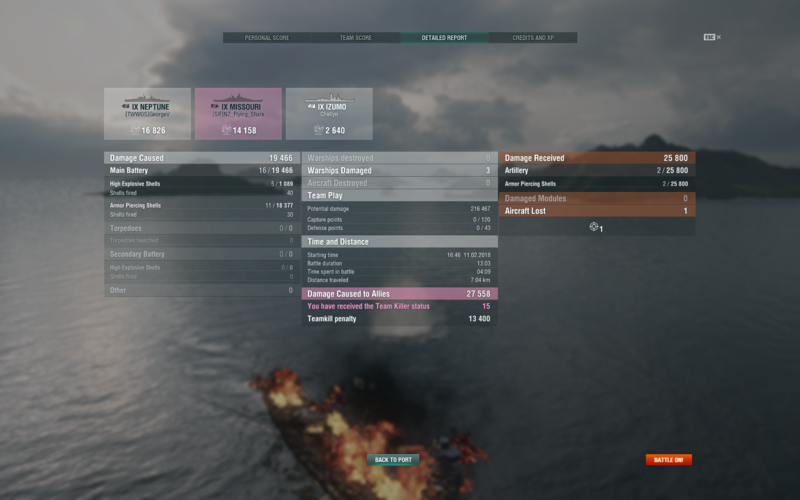 Unfortunately Missouris are really tall ships, Myoko guns have very flat arcs, and I managed to ping his superstructure with 2 HE shells of my outbound volley. That's all, as far as knew. My bad, but not the end of the world. A couple of minutes I exploded with a warning that I had been given team killer status. Since I was taking fire at the time, I thought I had been one-shotted by the enemy battleship ... but I couldn't figure out for the life of me who it was of my team I'd managed to kill. No torps. I was definitely shooting at the reds, no greens in my sights. Missouri still fine. Turns out I had killed myself. Unfortunately my earlier HE shell on the Missouri mast started a fire. He didn't use Damage Repair Party. He continued to burn. The burn damage was treated as additional "attacks" from me on my team with additional warnings. At some point, the damage reflection kicked in, and I died from the reflected hit. So a managed to do over 27k of team damage and sunk one team ship (me), all from accidentally clipping a battleship with two 203mm HE shells! P.S. Treating the shot and the fire damage as separate attacks is unfair "double jeopardy" in my view. P.P.S. In my defense, the top-down viewpoint in game gives the illusion that your guns have more height clearance than they really do, unless you zoom all the way down to the turret view. Yeah, You are right, but the point is WG shouldn't count FIRE (AND/OR FLOODING) as an additional attack. If you hit your ally with HE once then it should be once. The fire shouldn't be count as extra hits, but you still have to pay for the amount you dealt. Even you have the map awareness, still there are India Delta India Oscar Tango (or maybe troll) which they, somehow, manage to run in your well placed torps, launched to enemy that is dead by the time it go 3 km, which you have fired like 45 secs ago without reason. No enemy related stuff in sighted and he just run to my torps. It wasn't like I wasn't aware of the Missouri. I incorrectly judged he was far enough away that my shots would clear. Also just to be clear I think it's a nonsensical mechanic that you get a teamkilling penalty when you didn't actually kill a member of your team. Think about this: I did not get the penalty for damaging the Missouri. WG killed me as punishment for starting the fire and then branded me a teamkiller because I died. If I'd done the same thing but with a battleship, the reflected damage wouldn't have killed me and I wouldn't have taken the penalty. That's just messed up. 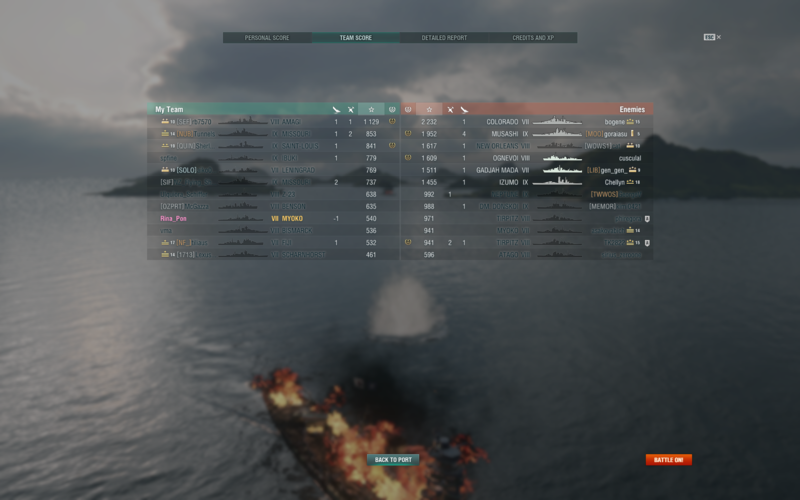 I once got a disciplinary penalty (killed by the game) + team killer after a Kurfurst on 10HP rammed my moskva. I was heavily reported that game because I had -2 ship kills in the post-battle screen and branded a team killer for 20 matches. You get the teamkiller penalty not just for team kills, but also if your team damage crosses a certain threshold. Also I don't think it is unfair that fire and flooding are counted. If it wasn't counted, I can easily grief other players by shooting at areas where HE won't penetrate and starting a fire. Friendly takes fire damage while I get off scot-free. Sure, the punishment might seem harsh, but take it as a lesson learnt. And this is why I zoom out after every volley. Thanks for sharing that. Believe it or not it it made me feel better. WG will take the damage you did to an ally off your own ship, and in this case that killed you. I think this is a very good mechanism, it prevents people to go around killing teammates for fun. What you did was clearly reckless, not a surprise your team lost. Spending some time in pink hopefully teaches you a lesson. It happens to everyone sooner or later. Take away from it why you want. Most people learn from it and there is rarely any threads about habitual team killers on the forums. Not sure he frequent's the forums, but i'll let him know you've posted here to him. Also, about the fire and flooding counting as separate damage, this counts as separate damage on enemy ships as well. This is part of why people who are good at DOTS get a lot of xp and credits. As someone who has been on the receiving end of friendly torps whilst my DC has been on cool down I wholeheartedly agree with the reflected damage mechanic. Team killing is one of the most toxic elements in WOT and the way things are right now it stops trolling tools. I think reckless descibes it better than stupid. The vast majority of people don't want to be pink, but if a friendly ship gets a bit too close to our target, that doesn't stop us from firing our guns or torps, and if he gets hit, his fault, right? I want my damage and my XP!